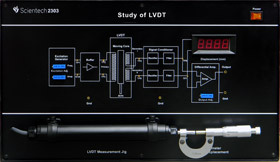 The potentiometric error detector associated with angular/linear position control system. Which is to provide an output angular position signal which precisely follows the input angular position signal. 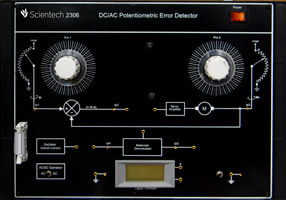 DC/AC POTENTIOMETRIC ERROR DETECTOR Scientech 2306 provides in-depth study of closed loop & open loop position control system. All the feedback control systems operate from the error signal which is generated by a comparison of the reference and the output. 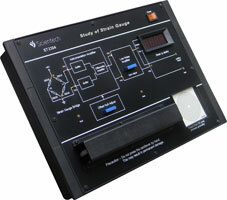 Error detectors perform the crucial task of comparing the reference and output signals. If the inputs and outputs are already in the form of electrical voltages then the error detector is a simple comparator. But in position control system the inputs and outputs are in the form of angular/linear displacement hence these displacement are converted into the analogous electrical voltage by means of potentiometer (3600 SHAFT ROTATION SERVO POT). Scientech 2306, DC/AC Potentiometric Error Detector is an ideal platform to enhance education, training, skills & development amongs our young minds.